Does its job fairly well! "A great MIDI controller for basic stuffs"
I make soundtracks for videogames and after more than enough time writing all the lines for my midi instruments in Logic’s piano roll I decided to buy a controler to make the whole production process faster and more musical. 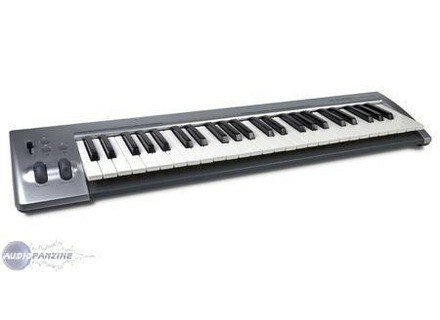 The chosen one was this M-Audio KeyRig 49. 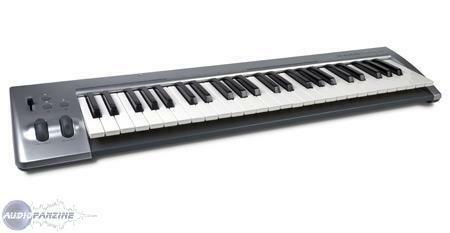 It has four octaves of velocity sensitive keys (but no aftertouch! ), a modulation wheel, a pitch bend wheel, a volume fader, octave up/down buttons, an ‘edit’ button (more on that later), sustain pedal input, on/off switch, finally the usb port to connect it to your computer (no ac needed), and absolutely nothing else. Construction is pretty good, but feels like it would get damaged if you drop it from a not so short height. No worries if you're always leaving it in the studio, just keep the box in case you need to move it somewhere else. Overall I really like the clean no-knobs look of it and its silver color. On a Mac you simply plug it, Logic recognizes the new midi in and you can start playing right away. If you're a piano player you probably won't like the weight and overall feel of the keys, they're plastic-y and very light. I (not a piano player at all) also prefer heavier keys, but these ones will do the job just fine. The only time I've ever read the manual was when I wanted to learn how to send the midi data to a channel different than one, and this is how you do it: press the 'edit' button once, the red light above it starts blinking, then you press one of the keyboards white keys for the desired channel (from D1 up), so: D1 for channel 1, E1 ch2, F1 ch3 and etc. I find it a clever way to reach a function like the midi channel select with only one button and the controller keys, very usefull if you like to have many instruments in the same instance of Kontakt, for example. The Keyrig probably has another couple nice things hidden in the manual, but seriously, I've never really bothered reading it past the channel select thing, never felt the need to. For a long time I didn't feel like I was being less productive for not having knobs or faders or pads on the controller. Even if I record an automation with that I always end up polishing it later in the mix, inside Logic. If you also do it, you probably won't miss the knobs too. I've tested many other controllers and keyboards from friends before buying the KeyRig 49, and think I've made a really good choice. For me and for my job, a midi controller is a tool that helps you have ideas faster: it's way more musical and productive to play around with a few keys to find a melody for a theme than to write it all on the piano roll or score editor and hit play on the DAW to hear how it sounds like every time you change a couple notes. The KeyRig does that without the extra clutter (and price) of a lot of knobs and pads. One thing that would be cool though is the aftertouch, its a nice and visually clean way to control a parameter in many virtual instruments that I miss here. Being a 49 keys controller I wouldn't call it exactly portable, but its also not huge and, compared to my LPK25, the two extra octaves are indeed quite useful to hear how a bass line sounds against a melody, to quickly make and visualize really open chord structures or the full note range of an instrument (or at least most of it). The LPK25 obviously wins on portability - and I have one because out of the studio two octaves are still better than none -, but I think that the KeyRig has a good bit of both things: its big enough to give you possibilites, but small enough to be carried around with not much hassle. So if you really don't need all the bells and whistles of a full-featured midi controller, get a keyrig, you won't regret it.